will be out of the office until 4/24. Welcome to my eBay Store. 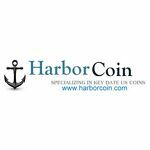 At Harbor Coin we specialize in rare U.S. Coins, Foreign Coins, Currency and Gold&Silver Bullion. We do have a store front location in Gurnee, IL and are family owned and operated. Please add us to your favorites and check back often to see what we have to offer!